Much of the activity in cities occurs in its various public and private spaces. How this space is organized is a means by which our interactions can be choreographed and encouraged. One space that is important to citizen wellbeing is called the third place. Not the home and not the workplace, a third place is somewhere that promotes conversations and encounters with friends and neighbours, often with some sort of shared connection. The feeling evoked is a sense of belonging. This could be a café, a pub, a park, or a library. Imagine what Vancouver would be like without our beaches, Stanley Park, or the Vancouver Art Gallery. Ray Oldenburg, author of the book “The Great Good Place”, calls these spaces essential to community and public life. He argues that third places are “central to local democracy and community vitality”. He adds that though they are radically different from a home-like setting, the third place is “remarkably similar to a good home in the psychological comfort and support that it extends”. At Quest, part of our mandate is to build community. We have relationships with many social service agencies in Vancouver, and provide volunteer and work placement programs for those in the neighbourhood. 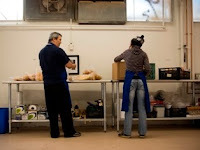 We also operate several of our very own ‘third places’: our three low-cost grocery stores. Food can be an item that evokes a shared connection. It is a basic necessity of life and has the incredible ability to bring together people. Food can become a powerful relationship builder with family members, friends, and even strangers. Our stores provide a welcoming environment from people of all walks to life to shop for the food they need to fuel their bodies. Most importantly, we provide a variety of options for people to choose from. We believe that income level should not prevent people from having access to healthy, nutritious food on a regular basis. We can thank our friendly staff, helpful volunteers, and wonderful clients for creating this environment in our stores. What’s your favourite third place? Are healthy school lunches driving your kids to junk? In the leafy surrounds of Kerrisdale, an old-money enclave on Vancouver’s west side, Point Grey Secondary School is losing the junk food war. Two years ago the student cafeteria revamped its menu to meet British Columbia’s new food regulations for schools. Salads now have reduced-sodium dressing, cookies contain less sugar and potatoes are baked, not fried. But when the lunch bell rings, Point Grey students swarm to the neighbouring McDonald’s, 7-Eleven, Frankies Candy Bar, and Flying Wedge, where $3.50 buys a “student combo” of a pizza slice and pop that add up to 900 calories. While I was taking photos for Quest I noticed this pile of empty plastic containers sitting on top of the recycling bins. This brought a few questions to mind. Due to a variety of circumstances, even we at Quest are unable to use absolutely everything. Sometimes products arrive already expired, and other times there are just more jars of pickles then there are people. When this happens, we try not to throw anything away. The contents are composted and the containers are cleaned for recycling. This brought to mind more questions. Does it really get recycled? Where does it go? After finding the recycling pile I came into the office and was talking about it with Kyle. I was surprised that all the items were recyclable, and reflected back on a documentary I watched over the weekend about plastic. Even though it is possible to recycle some items, there is either no market for the recycled product or no local facilities to process it. Lots of it was ending up at the landfill even when it had been put in the blue box. I looked up the website for the company that Quest uses to recycle, Urban Impact. The first thing I noticed was that they recycle soft plastic such as pallet wrap and plastic bags as well as batteries, fluorescent tubes, and hazardous non-biological stuff like drywall and fiberglass, along with the typical mixed containers and paper recycling. Last year (2009) Quest diverted 115 cubic yards of recycled material from the landfill using Urban Impact. I’m told that is equal to about 57 full size pickup trucks and 17 tonnes of carbon emissions. We try to put out the best quality of produce but it’s inevitable that there is some spoiled food that can’t be sold. At Quest we compost any organic matter we can’t sell, and is picked up by Smithrite Disposal ltd. You’ve probably seen the logo on bins and trucks around the city. I didn’t know that they were more than a garbage collection company. They will pick up fruits & vegetables, food scraps, bakery discards, flowers, leaves, plant stalks, soiled paper like napkins and coffee cups, meats & fish, coffee grounds/filters, tea bags, and biodegradable products including plates/ cutlery/ cups. Smithrite can work together with customers like us to find ways to reduce waste and minimize what ends up in the landfill by performing an audit. They also do residential pickup services and I was interested to see that they are working on a pilot project with Coquitlam and Metro Vancouver where 500 households can include household scraps in their yard trimmings. Photo of the bins and containers.